Explanation: Last Saturday, the Space Shuttle Discovery lit up the night as it climbed into orbit above planet Earth. 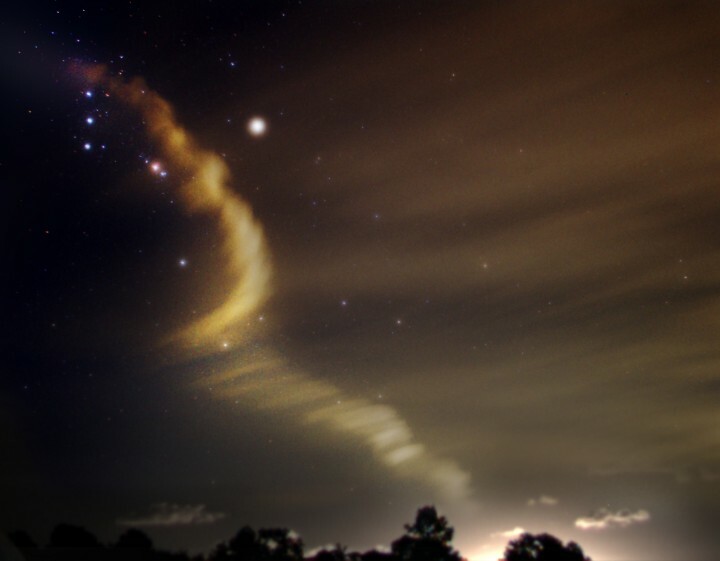 From Oak Hill, Florida, USA - about 30 miles north of the Kennedy Space Centre - design engineer Andrew Arigema tracked the shuttle and recorded a four minute time exposure of the exhaust plume along Discovery's path against the background of the starry sky. At the upper left, the end of the drifting plume is punctuated by Alnitak, Alnilam, and Mintaka in a vertical line, the belt stars of Orion. To the right of the belt stars, the pinkish jewel in Orion's sword is not a star at all, but the great Orion Nebula. Still farther to the right, at the foot of the hunter, lies Rigel, the brightest star in view. Rigel is a hot supergiant star some 700 light-years in the distance.